this entry is devoted to. HOW MUCH CAN THE URINARY BLADDER HOLD? ounces. To picture how much this is, look at a bottle of soda that is 16 ounces. WHERE IS THE URINARY BLADDER LOCATED? The urinary bladder is located behind the pubic bone and is protected within the pelvis. back part is made of the sacrum (a triangular bone) and coccyx (a beak shaped bone). the urinary bladder is located is to say that it is in front of the rear end. WHAT IS THE URINARY BLADDER MADE OF? As was mentioned earlier, the urinary bladder is a muscular organ. (remove) wastes from the blood. HOW DOES SOMEBODY KNOW WHEN TO URINATE? brain, which is experienced by the body as discomfort. This signals to the person that it is time to urinate. 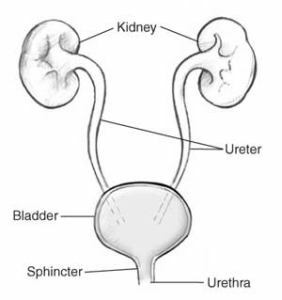 urine outside of the body through the urethra. HOW DOES SOMEBODY RESIST THE URGE TO URNATE? signals to stop the bladder from emptying. CAN A PERSON RESIST URINATING FOR AS LONG AS HE/SHE WANTS? HOW LONG DOES IT TAKE A CHILD TO GAIN FULL CONTROL OF THE URINARY BLADDER? control, but some may take longer. For infants, emptying the bladder is a reflex (automatic action). WHAT ELSE IS THE URINARY BLADDER KNOWN AS? WHAT IS THE ORIGIN OF THE TERM, URINARY BLADDER? Urinary bladder comes from the Greek word "ouron" meaning "urine," and the Anglo Saxon word "bhel-"
meaning "to swell." Put the two words together and you have "to swell (with) urine."